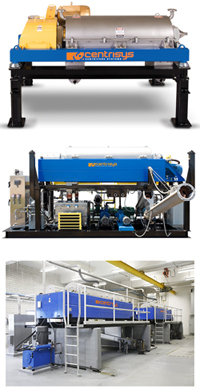 Centrisys decanter centrifuges and dewatering systems deliver unsurpassed performance in applications across many manufacturing industries. Whether your goal is reducing costs by separating wastes for more cost-effective disposal or increasing revenues by recovering more valuable materials, Centrisys has the application experience to help you improve your bottom line. Skid mounted as well as new or rental trailer mounted systems available. By efficiently separating production waste from wastewater, Centrisys decanter centrifuges produce disposal costs savings that bring substantial return on investment for companies in a wide array of food and beverage operations.